He is the elder of Kong and the first to master the game. Some have called him the greatest arcade video game player the world has ever known. 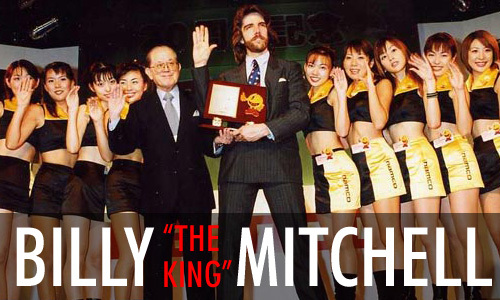 Billy Mitchell has passed into legendary status; a true icon of competitive gaming if ever there was one. The subject of volumes of scrutiny, media attention, several documentaries, and the undisputed megastar of the Golden Era. It would seem, however, that in the minds of much of today's Donkey Kong community, he might as well have stayed there. In recent times, Mitchell has been standoffish, and performed tepidly in live events. Many (at least within the community) have all but written him off as a relic of the past, focusing instead on the younger, hungrier new breed of Donkey Kong contenders. What a difference a few years out of the spotlight can make! For some time now, business and family have gotten between Mitchell and competitive gaming. But if he ever again manages to find the time, energy, and desire to actually return to fighting shape, he won't merely be "a force to be reckoned with." After all, that description fits all of the top competitors. With Mitchell, the potential is there for a comeback into the Top 10, though likely not the world record. So the question isn't "can Billy Mitchell return?" We all know that he can. The question is "how badly does he want to?" When you're already a legend, you don't have much more to gain. But perhaps the day is coming when all of the naysaying will put some of the old fire back in Mitchell's belly?